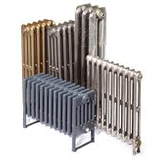 3 Column Cast Iron Radiators are a popular narrow column design available in three heights. A traditional Victorian cast iron radiator which was first produced in the 1880s. Today, this simple design gives a contemportary feel, especially when fully polished and works well in corridors or where space is at a premium. These cast iron radiators can be used in conjunction with 4 Columns, 9 Columns or 2 column versions that are complimentary to these castings. Delivery is made using a pallet service, the average delivery time is 7 - 14 working days subject to your choice of finish. To confirm our present delivery time please call us on 01723 321 333.